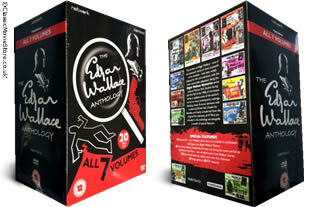 The Edgar Wallace Mysteries complete DVD set. The complete collection of all 49 films ever made in 7 volumes on 20 dvd's. DELIVERED FREE IN THE UK. The thrillers of Edgar Wallace, one of the twentieth century's most popular crime writers, have been widely adapted for television and film the most memorable of which is the Edgar Wallace Mysteries, filmed at Merton Park Studios in the early 1960s. Not seen for decades and freshly transferred from the original film elements specifically for this release, This DVD box set includes 7 Volumes. 20 DVD set delivered to your door.